In reviewing the past two years of Nice Insight data on outsourcing relationships in the drug development industry, we have noticed some subtle yet important differences in the preferences and behaviors of buyers of outsourced services. For a contract service provider, these variances reiterate the importance of differentiating one’s business from the competition in order to develop strong customer awareness (CA) as well as the importance of targeted marketing that helps to shape prospective and existing customers’ attitude towards the company, or customer perception (CP). Each year, our team identifies the six most influential attributes when it comes building new outsourcing relationships. These form the basis of a CRO or CMO’s customer perception score. Buyers of outsourced services rank the traits in order of their influence on partner selection and then each company included in the research study is evaluated against these measures. Moving into 2013, the six traits remain consistent — innovation continues to be a primary concern among drug developers and edges its one-time predecessor in the top six — accessibility. But over the past two years, the ranking of pricing, productivity and regulatory track record have shifted. Two attributes tend to rise to the top of almost any list of desired attributes in an outsourcing partner — quality and reliability. Since Nice Insight’s first survey, these two have maintained the top two rankings and we expect them to continue to carry the most weight among sponsors assessing contract service providers. 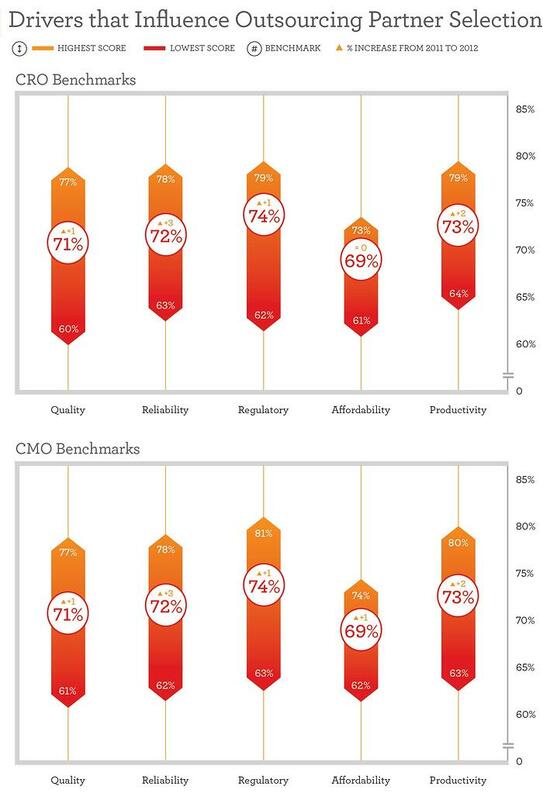 Benchmarks for quality and reliability — for both CROs and CMOs — increased from 2011 to 2012 by 1% and 3% respectively, which suggests that CROs and CMOs are making an effort to improve in these areas and this is being recognized by the buyers. The research results have helped to debunk some rumored theories regarding pricing. The notion that “it all comes down to cost, and the cheapest bid wins” loses credence when affordability drops from third to fourth in importance. The research results have helped to debunk some rumored theories regarding pricing. The notion that “it all comes down to cost, and the cheapest bid wins” loses credence when affordability drops from third to fourth in importance, and that businesses with higher prices (and lower affordability scores) frequently score better on the “Project Likelihood” measure than lower priced competitors. Similarly, the belief that “maintaining compliant operations is a given in this industry” has been shattered with a number of major brands facing product recalls in the past two years, leading biopharma companies to reprioritize. This was reflected in our results, with regulatory track record moving up in ranking from fifth to third place. Contract businesses faired well among sponsors’ perceptions, with the benchmark for regulatory compliance increasing by one percentage point among both CROs and CMOs. In addition to the changes in preferences, our survey results have revealed some changes in outsourcing behaviors. Outsourcing spend rose slightly — coinciding with a 6% increase among outsourcers with a budget of $10-50M range, which was reflected in a 5% decrease among those with a budget under $10M. Respondents from Big Pharma, Biotech and Specialty Pharma companies indicated they outsourced more services than they had one year before, with Big Pharma showing the largest average increase of 1.4. The average number of services outsourced appears likely to remain steady among emerging pharmaceutical or biotech companies. Not only have there been changes in behavior and preferences on the buyer side, CROs and CMOs have made changes to the way they present their offering to the market. In the past year, 30% of the businesses included in Nice Insight’s brand index released new print advertisements, 17% launched new websites and 6% updated their company logo. Marketing communications are one of the leading ways for a company to manage its reputation; thus launching a new campaign or restructuring information on a website is an effort to further influence perceptions of a business. While some may feel marketing materials are mostly cosmetic, the tools are often used to symbolize the changes occurring below the surface.